The Hoover Institution Library and Archives is home to art with enduring historic value that is both diverse in content and style. One such collection, the illustrations of Mieczyslaw Jałowiecki, were recently photographed by the Digital Imaging Lab so we could provide digital copies to our partner institutions in Lithuania and Poland and eliminate handling the originals during on-site research. Unlike other collections of art at Hoover, scenes of war, revolution, and destruction are absent in these illustrations. Rather, Jałowiecki depicts his culture, his history, his motherland--before it was nearly obliterated by war and totalitarianism. Jałowiecki (1886–1962) had numerous occupations through his long life: landowning noble, agronomist, civil servant, diplomat, businessman, writer, and artist, to a name a few. Yet his versatility did not spare him from the social, economic, and political upheaval of his times. Jałowiecki was twice forced to abandon his land and country, once in Lithuania following World War I, and again with the Soviet/German invasion of Poland in 1939. Despite the vicissitudes of revolution and war, Jałowiecki applied his knowledge and experience to serve his people, history, and culture. He ensured that food from the American Relief Administration passed unimpeded through the port of Gdańsk during 1919–1920; later in his life he was an activist for the Polish government in exile, a publisher of pamphlets and books about agronomy and Poland, and the author of a sixteen-volume memoir. In all, Jałowiecki created over a thousand illustrations, each with an accompanying title and, often, a geographic and historic summary of the topic. 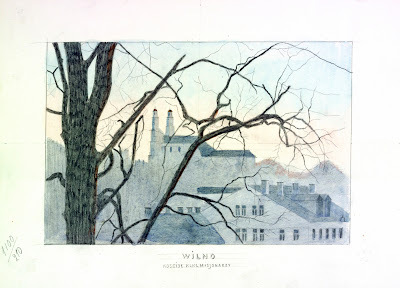 Using watercolor and pencil as his mediums, Jałowiecki depicted manors, farms, and cities he saw during his extensive travels throughout western Russia, the Baltic region, and Poland. He also relied on photograph collections of fellow émigrés in England, along with resources from the British Museum, to create visions of sacred icons and shrines, medieval rulers, pivotal battles, archeological sites, and the flora and fauna of the region. Producing the digital images from the materials could not be done with a flat bed scanner, for it requires an unacceptable amount of contact with the illustrations; we thus made each photograph with our medium-format digital camera. 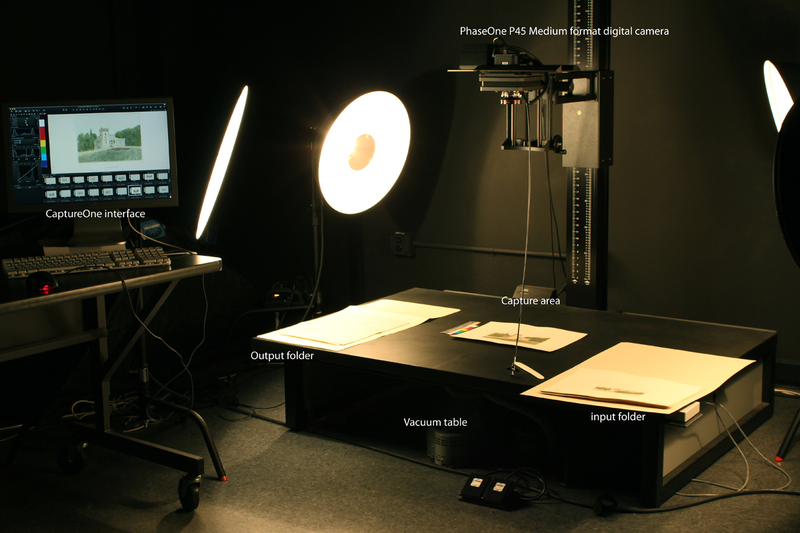 In consultation with the Book and Paper Preservation Lab, a workflow was designed to minimize handling and to quickly capture each illustration in sequential order. In planning the workflow, however, it became apparent that each illustration would need to be interleaved at some point to improve their state of preservation. This procedure, a considerable undertaking, became one of timing: Should interleaving occur before, after, or during the photography phase? The answer is a salient example of why planning a digitization project cannot be arbitrarily reduced to its most basic elements of scanning a document or snapping a photograph. A process that appears simple can actually be complex or a component of a larger and more intricate process. For our purposes, when planning a digitization project, the decisions we make--be they standards, methods, or the order in which they are implemented--are treated as though each will reverberate across the entire project. A critical decision was to have the illustrations interleaved after the photography phase. Interleaving the illustrations with acid-free nonabrasive paper is critical to their long- term survival. But interleaving requires a great deal of time, as each illustration must be individually enclosed in a leaf of paper. The additional bulk of that paper would require the entire collection be redistributed among their folders and boxes to prevent overfilling, another important component of long-term preservation. Because the location of each illustration is described in the finding aid, that redistribution would also require that the finding aid be revised, another critical but time-intensive task. Finally, handling each illustration after interleaving requires each to be removed from its individual leaf and then returned after being photographed, thus incurring more time and cost on the project. All these factors led us to conclude that interleaving after the photography phase was the most efficient use of project resources. Another example of the complexity entailed in planning a digitization project arose when it came to creating filing names of digital images to correspond with the original filing names created by Jałowiecki. Variants and errors are not uncommon in large collections. As a collection grows, the probability of a variant or error occurring grows as well. We encountered duplicate catalog numbers that described entirely different images. We also encountered descriptions of an illustration on the reverse that did not match the image on the front and unused catalog numbers that created errors in the sequential numbering of each digital image. Finding a mislabeled file is not only difficult, the error of each mislabeled file will also cascade over the files that follow it when named en masse, creating new errors and compounding the problem. Multiple steps were required to eliminate variants and errors in the filing names. First, we separated out those files with duplicate catalog numbers and put one group in a separate folder. Free of duplicates, we then separated the remaining files into two groups: front and back. In this way, both groups could be renamed separately, thus preventing the back of each watercolor being renamed as though it were the following illustration. Second, we created targets for each catalog number without an associated image so they could be inserted in each group. These targets prevented our program from naming an illustration with the “empty” catalog number that preceded it. With these steps in place, both groups were quickly processed. After renaming, every file with a duplicated catalog number was given a suffix to distinguish each from its counterpart. Creating and arranging the digital component of the Jałowiecki illustrations was both a privilege and a challenge. But paramount to the Digital Imaging Lab was the legacy we would impart. The decisions we made would not only reverberate across the span of the project but across the Atlantic Ocean and, possibly, across generations of students and researchers in Lithuania and Poland. The Jałowiecki illustrations will continue to inform research here at the Hoover Institution, but now they will also enrich historical research and cultural memory in Lithuania and Poland.